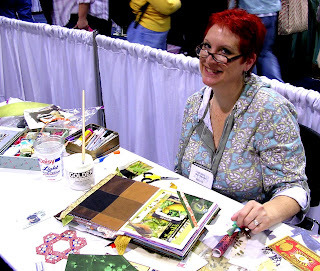 Here's Belinda Spiwak (Crazy Art Girl) doing demos at Open Studios. Belinda is freakishly talented and I adore her. She is particularly generous, both in person and also on her blog. She is always willing to share everything she knows. Basically, she's just awesome! The dear, wonderful Beryl Taylor was there in person--a big thrill for me! 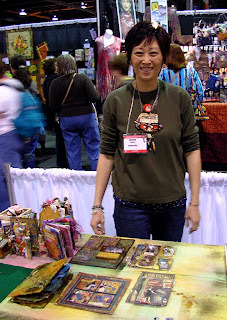 She was adorable, and her artwork, below, was even yummier in person. I got to touch it--yay! Deb Silva is so cute, isn't she? She hooked me up with some nice ephemera, and since my art name is ephemeral alchemy, you KNOW how I feel about that! 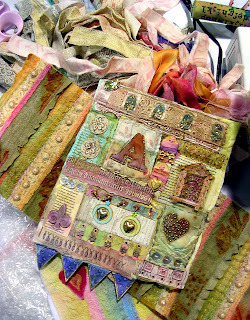 Her altered books are superb and her blog is a delight to read. This is Ms. Pokey Bolton herself in her seventies disco garb. She loves to party and make sure everyone is having a great time, but she did make everyone beg for scraps and supplies during the Make It U Project Challenge. 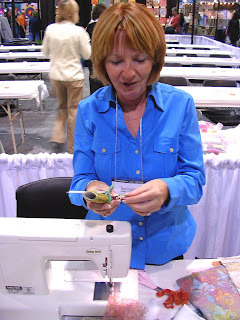 You wouldn't believe what Tracy Stilwell from ArtGirlz had to do for a blob of glue!